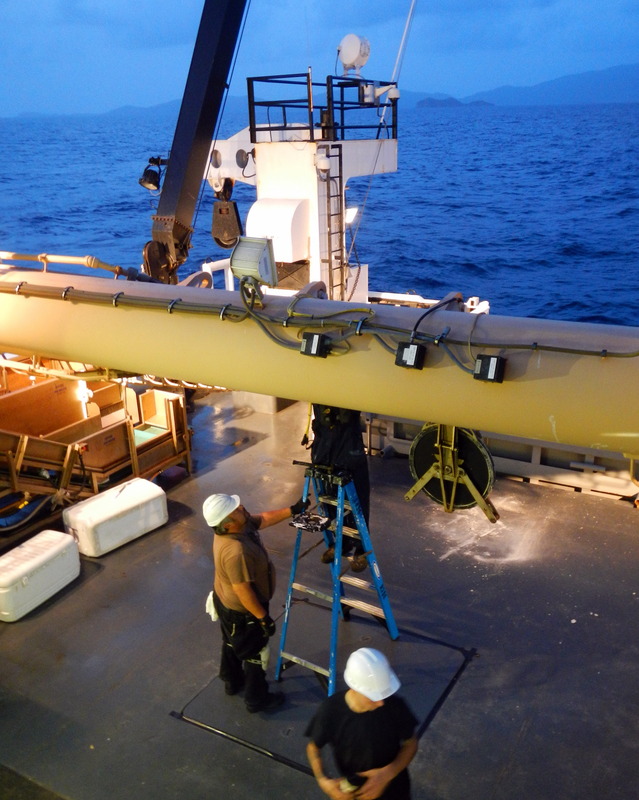 Another aspect (much more technical) of the scientific research conducted on this cruise is the collection of acoustic data. This field is continually evolving as the detection resolution improves allowing scientists to more precisely identify fish. This has been used with more success in fisheries farther north because the schools of fish are more likely to be monospecific (a single species). However, the technique still needs improvement in warmer waters where the fish assemblages tend to be multi-specific (having a much greater variety of fish). This field of study is called Hydroacoustics (hydro- means water, and acoustics refers to sound). It is the science of how sound moves through water. Leonardo da Vinci noticed how sound travels through water in 1490. He noticed that, “If you cause your ship to stop and place the head of a long tube in the water and place the outer extremity to your ear, you will hear ships at a great distance from you.” (Urick, Robert J. Principles of Underwater Sound, 3rd Edition. New York. McGraw-Hill, 1983.) World War I helped promote innovation in the field, especially with the need for anti-submarine detection devices (Wood, A. B., From the Board of Invention and Research to the Royal Naval Scientific Service, Journal of the Royal Naval Scientific Service Vol 20, No 4, pp 1-100 (185-284)). Hydroacoustic instruments utilize SOund Navigation and Ranging, more commonly referred to as SONAR. The ship Pisces is equipped with a system located on the center board; this is a flat structure that can be raised/lowered through the water column beneath the center of the ship. 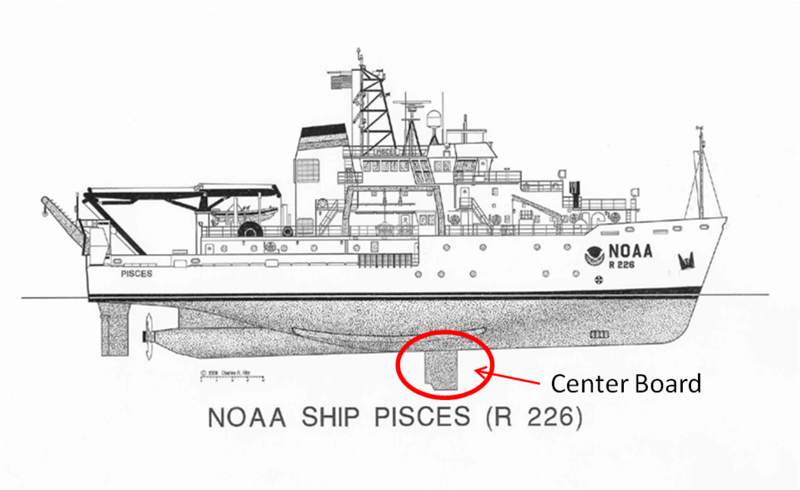 Line drawing of the NOAA ship Pisces showing the location of the center board. The system used is a sonar beam that is split into quadrants. This instrument is used to assist in determining fish abundance and distribution. The premise is relatively simple: an echo sounder transmits a pulse of energy waves (sound), when the pulse strikes an object, it is reflected (bounced) back to the transducer. The echo sounder is then processed and sent to a video display. This is the same general process behind the recreationally available fishfinder. A short burst of energy is focused into a narrow beam. When this beam encounters an object such as a fish, a school of fish, plankton, or other object, some of the energy bounces back up through the water to the transducer. It is the detection of these reflections that allow scientists to determine location, size, and abundance of fish. These reflections show up on our video monitor. These measurements are combined with groundtruthed data (for example, fish collected in the field, camera images). One of the difficulties in data interpretation is that often, the signals that appear on the computer monitor have false readings. This is a result of the sound wave bouncing multiple times. It travels to the bottom from the transducer, strikes an object, returns to the ship, bounces off the ship back toward the bottom, strikes another object, and is detected yet again. 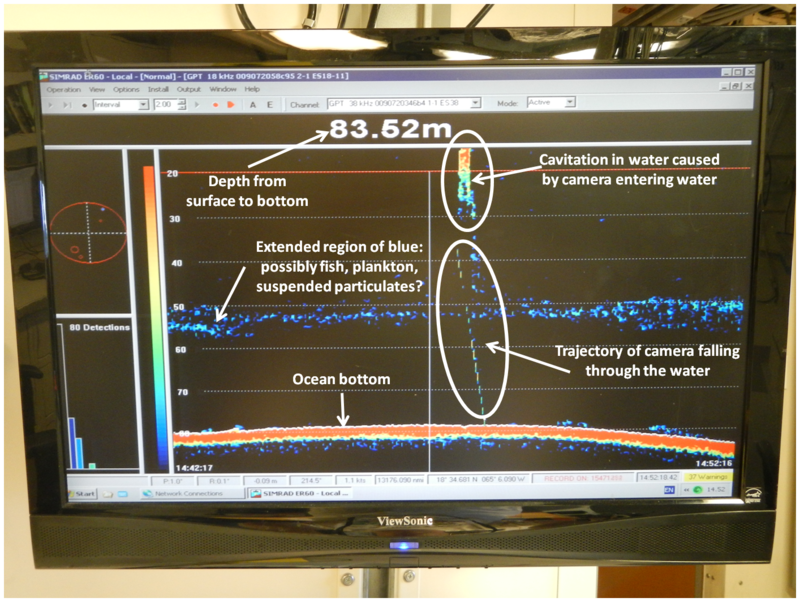 Real-time annotated echogram at sampling site. Last night the crew of the Pisces carried out a task that they don’t normally perform. The Pisces was created for fisheries research projects – it focuses on collecting fish samples either by bandit reel, longline, or trawling. This particular operation was to deploy the anchor for a buoy that will be attached at a later date. When the buoy is ready to be attached, another vessel will bring it out to the site and divers will go down to the anchor to make the final attachment. 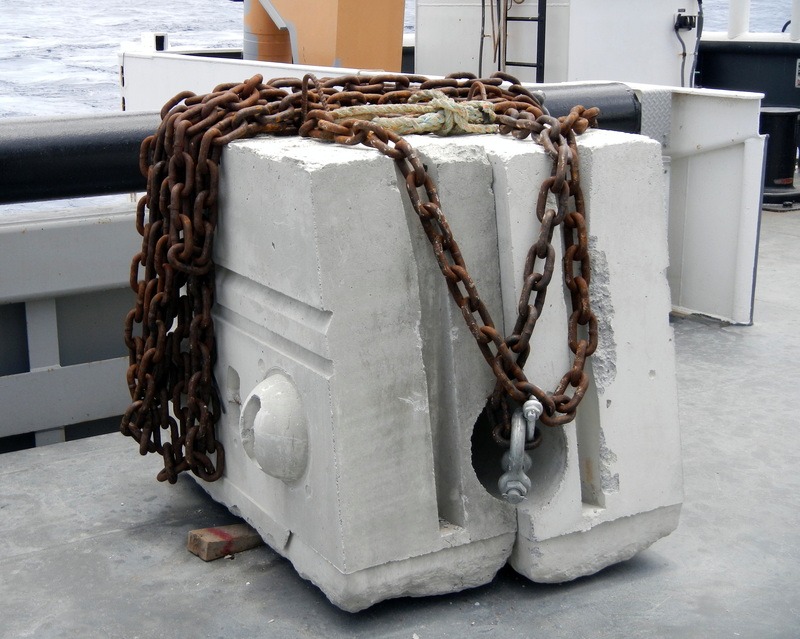 The anchor consists of a huge rebar-reinforced concrete block with a very long chain that has marker floats attached at the end. Logistically, this took some planning; the A-frame had to be raised and the anchor lifted with the Gilson winch with a 1″ spectra line (has an enormous tensile strength). The gate to the ship’s ramp was lowered and the A-frame (or as the deck hands call it, the “Tuna Tower”) repositioned so the anchor was hanging over the water. The rope holding the anchor, chain, and float was cut through, and the anchor plunged to the ocean bottom. Again, the crew made the operation go smoothly and demonstrated their ability to complete unexpectedly assigned tasks. Today was a slow fishing day – no fish at all. Without any fish to “work up” (collect samples from), the day goes more slowly and we have more down time. With the extra time, I had a chance to interview Kevin Rademacher, the Chief Scientist on the cruise. LU: What is your official job title and what are your job duties? KR: I’m a Research Fisheries Biologist. 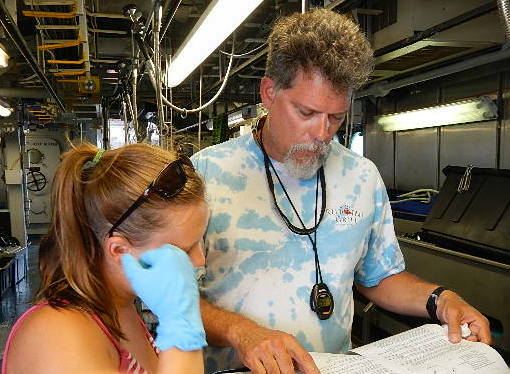 I work for the Reef Fish Unit at the NOAA Fisheries Lab in Pascagoula, MS. I am the Senior Tape Reader/Reviewer, in charge of the readers that analyze the video data we collect from Reef Fish Surveys. I also help plan, organize, and run the surveys. Additionally, I participate in trawl surveys and anything else the lab needs done. LU: When did you first become interested in the ocean and marine sciences? KR: I guess that would have been when I was really young. There is a photo from the Panama City, Florida newspaper, two weeks after I was born with my parents pulling me in a homemade wagon along the beach! I knew in junior high school that I wanted to be a cross between Jacques Cousteau and Marlin Perkins of Mutual of Omaha’s Wild Kingdom. LU: It’s such a broad field; how did you narrow your focus down to what you’re currently doing? KR: I got lucky and kind of fell into reading underwater videos at the initial stages of the project and fell in love with being the proverbial “fly on the wall”! It has allowed me to see the fish in their natural habitat, different color phases, behavior, etc. LU: If you were to go into another area of ocean research, what would it be? KR: Marine Mammal Studies. After college I trained dolphins and sea lions and put on shows with them for a local Oceanarium on the Mississippi Gulf Coast. LU: What is the biggest challenge in your job? KR: Communicating with people and writing papers. Ariane Frappier and Kevin Rademacher reviewing a dichotomous key in order to determine the species of a fish we caught. LU: What do you think is the biggest issue of contention in your field? KR: The impression that commercial fishermen have regarding the work we do to regulate the fisheries they work in. LU: What are some effects of climate change that you’ve witnessed during your career in fisheries research? KR: The decline of coral reefs and overfishing of some species. LU: In what areas of marine science do you foresee a lot of career paths and job opportunities? KR: Ecosystem management and data modelers. There has also been a decline in taxonomists over the past few decades. LU: How would you explain your work to a layperson? KR: I use underwater cameras to help assess populations of reef fish, especially snappers and groupers. The data collected is used to manage those fisheries. LU: If a high school student wanted to go into your field of study/marine science in general, what kinds of courses would you recommend they take? KR: Math, Biology, Chemistry, and any other science courses available. LU: Do you recommend students interested in your field pursue original research as high school students or undergraduates? If so, what kind? KR: Most definitely! Whatever they are interested in would be beneficial. Well, only two more days left with the scientists before we pull into San Juan, Puerto Rico. We have 17 more daytime sites to sample and then this survey will be over. The scientific crew will be flying home on the 25th, and once home, their work will really begin. Back in the lab, they will be analyzing the data and reviewing the video. Some of them will be going back out on other cruises. Kevin Rademacher will be going out on another reef fish survey in the eastern Gulf of Mexico. It is currently delayed because of the potential formation of tropical storm Debby. Joey Salisbury has a couple more; he will be going on a longline cruise and then another reef fish survey, both of which will be in the Gulf of Mexico. Arian Frappier will be heading off to begin a masters program in marine systems and coastal studies at Texas A&M Corpus Christi. After a day’s shore leave in San Juan, I’ll continue on to Mayport on the Pisces. During this time, I’ll focus on the crew members and their jobs. The cruise will definitely take on a different feel at this point, but it will give me an opportunity to explore other ocean related careers.